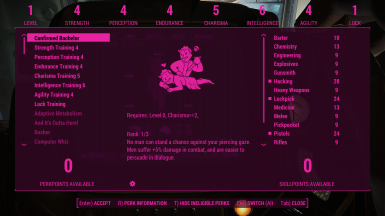 This mod adds the long lost and greatly missed perks from New Vegas! Requires Neanka's LevelUpMenuEx﻿ to work and everything that mod entails. work as intended as I couldn't find where the effect was implemented in the main fallout4.esm. 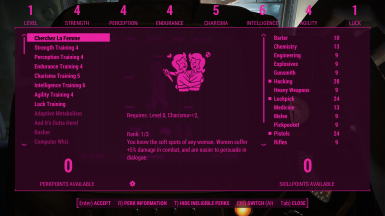 The perks are just copy-pastes of the standard Lady Killer and Black Widow perks with som quick changes to what gender the effects apply on. Unsure, should be compatible with other mods that uses LevelUpMenuEx to add perks or skills. Tested with Be Exceptional and is compatible.